Co-opting the idea of supposed religious determinism and putting it to use in the political arena is a time-dishonored tradition that goes back to the first creature which crawled forth from the primordial ooze and made his way straight to the top of the mountain to lord it over the other oozelings. In terms of Christianity itself, it goes at least as far back as Constantine claiming to have Jesus on his side and insisting that all of his soldiers paint crosses onto their shields prior to viciously butchering their enemies, despite the fact that mister pontifiex maximus himself did not officially convert until on his deathbed. One wonders how his clearly being ruled by superstition and political decorum didn’t precipitate calls of hypocrisy, if not heresy, but I suppose nobody wanted to be the one telling the emperor he had no clothes (or religious authority). Similar legalistic posturings and propaganda masquerading as true faith-based initiatives have continued through the ages, and that includes much of the activity of the so-called Temperance Movement of the 19th and 20th centuries. While much of the momentum behind this ideology boiled down simply to rural villages and towns resisting their way of life being on the decline due to the increased industrialization of the modern world, the rise of alcoholism as a social ill provided a convenient focus for the revival of “small town values” and lots of “come to Jesus” preaching. You might be surprised to discover how little alcohol and alcoholism had to do with the true impetus behind Prohibition in the United States. Likewise, there were a variety of underlying cultural, political, and social variables in play in the very early 20th century when the international Temperance Movement was coming to a head, and as absinthe was so popular in France, Switzerland, and other European nations, it made for a logical target for “the drys'” opening salvo. Below, see an original copy of the infamous anti-prohibition poster created by Gantner which was first published in “Le Guguss,” a Swiss satirical revue edited by a man named Louis Bron. 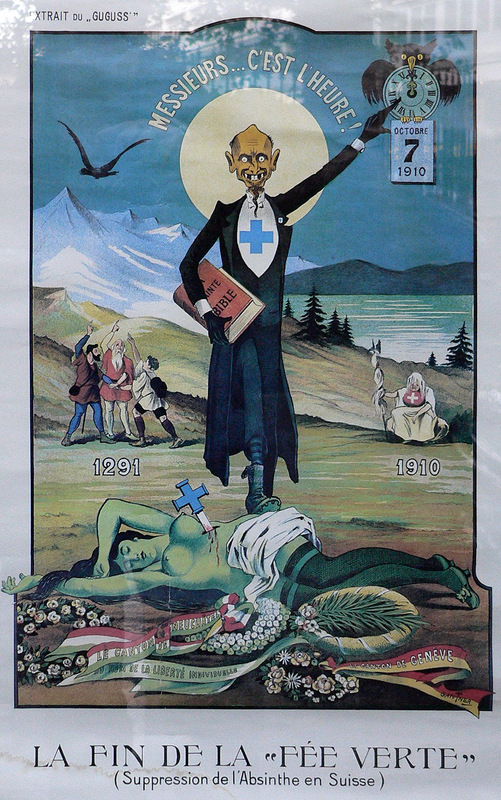 The poster decries the “death of absinthe” in Switzerland as a result of the 1910 ban. A rather macabre prohibitionist in the garb of a Catholic priest is seen standing on the corpse of the green fairy, a rictus smile across his face betraying his supposed honorable intentions. Behind him are Swiss citizens beseeching the heavens, as Switzerland herself sits in dejection. While every absinthe enthusiast fantasizes about stumbling across a cache of old dusty crates, prying them open with a crowbar and searching through the 100+ years old packing material to discover several bottles of pre-ban absinthe, it is in fact a rare treat to have even so much as a 1 oz sample. I myself have had the good fortune to acquire three such samples, and they are a unique experience to look forward to in the weeks leading up to tasting it, and to savor for years afterward. However, there are a few excellent modern absinthes which are likewise a rarity, even after a span of only a few years. One such absinthe is a Swiss la bleue called Sapphire, which was distilled by Claude-Alain Bugnon in 2010 (and perhaps earlier, as well). This fantastic blanche was beautifully clear, as are the best la bleues which come from Switzerland, but it also had a higher thujone content than is allowed by law, which is why it is no longer available. While the amount of thujone is absinthe is already minimal, the legal limit for absinthes in the United States is 10 ppm, while in Europe the limit is 35 ppm. I have personally never experienced any of the hallucinatory “effects” which many folks hope and wish absinthe produced, and chemical tests have likewise debunked the notion. However, old ghosts are hard to kill, and so the measurable amount of thujone is strictly enforced. 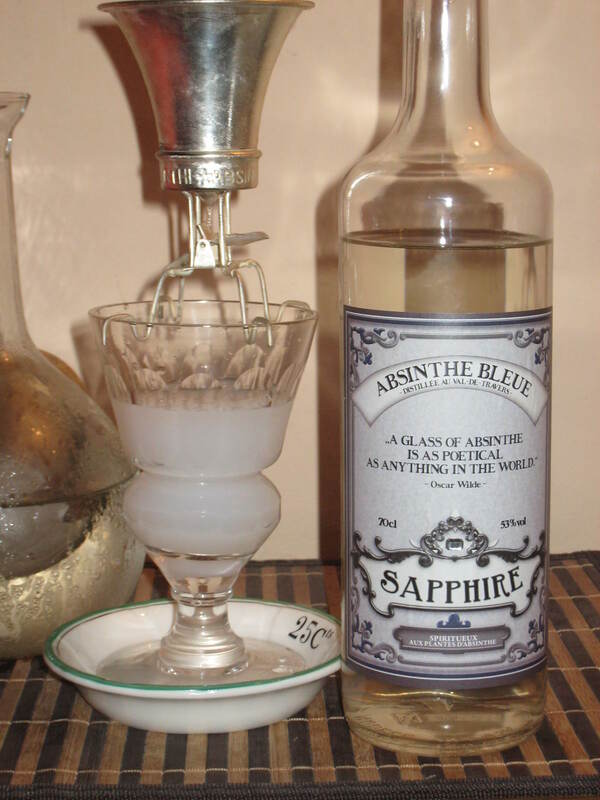 The TTB (Alcohol and Tobacco Tax and Trade Bureau) in the United States even goes a bit further, insisting that no absinthe product can have the label “absinthe” as a stand-alone word (which is why so many are called “absinthe superiore”), nor can names or graphics hinting at death, the occult, visions or hallucinogenic effects be part of the labeling or packaging. One gets the impression that if someone said “boo” while they were looking at a bottle of absinthe they would wet their pants and call in the National Guard. But oh how I digress. 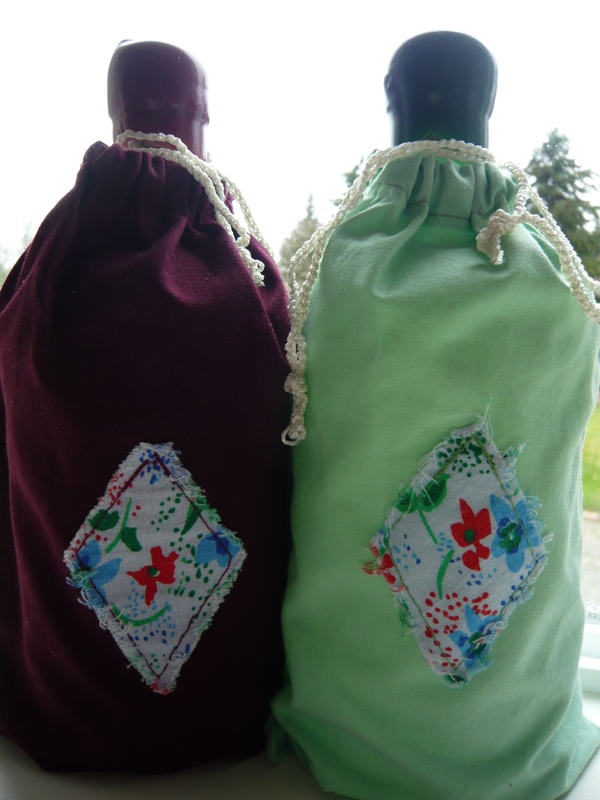 In any case, no true absinthe lover cares about the thujone level, as it is so negligible an amount, whether it is 5 ppm or 50 ppm. When a European friend offered me a sample of this rare and hard-to-find absinthe, I did say no to her, and after experiencing it I’m so glad I didn’t. Simply opening the bottle and inhaling the aroma was a true joy. Some blanches have a scent reminiscent of wet grass or seaweed at the center of their aroma, which is a bit off-putting to me, but Sapphire was strong with crisp wormwood and hint of baby powder, which is a common descriptor for hyssop. I figured that this absinthe would be sweet, and it was. Rich with herbs, the louche finished so quickly that I nearly missed it, and this is one that you want to use a slow drip on with ice cold water. But the taste! The fennel and melissa (lemon balm) were definitely up front and extroverted, but the very fine wormwood maintained a hot rhythm section underneath which wouldn’t be ignored. The drink was very crisp, and while the mouthfeel wasn’t what I would describe as creamy at first (which is not a criticism, but simply an observation), adding half a teaspoon of agave nectar added that dimension to it. While blanches are traditionally not sweetened, I do still tend to do so with about half as much sugar or agave as I would use with a verte. This absinthe was delicious with or without sweetener. Oh, and for the record, I neither saw fairies, monsters, nor devils; I did not paint a beautiful picture or write a heart-rending poem; and I did not cut off my ear and have it couriered to my favorite prostitute. An opportunity squandered, I suppose. But at least I do have a pretty picture of the Sapphire bottle, along with a louched dose of it in a Pontarlier glass with “see-saw” brouillieur on top, which was taken by “Michael in Poland.” Enjoy! The tick-tock sound means it’s time for absinthe! There’s more than one way to louche an absinthe, and one of the more novel and entertaining ways devised in the 19th century was via an “auto verseur” brouillieur. A brouillieur (also known as a “dripper”) does exactly what it sounds like – it drips water droplets into the absinthe. In a way, absinthe is simply a liquor concentrate, designed and distilled specifically to be reconstituted with water. Exactly how much water is used to dilute the liquor depends partly on how high the proof is, and partly on personal taste. In general, a 4:1 ratio is a good estimate to begin with. Adding the water slowly produces an intriguing cloudy louche as the essential oils are released, but how that water is slowly combined with the absinthe is open to your imagination and preference. A thin stream poured from a carafe was the most common way to louche a glass of absinthe in the 19th century, while glass brouillieurs (essentially small bowls with a tiny hole in the bottom for water to drip through) might also be fitted on top of a glass of absinthe for water to drip through. In the mid 19th century, one particular absinthe brand named Cusenier came up with the “auto verseur” (colloquially referred to as a “see-saw” brouillieur) for dripping water into absinthe which was both fun to watch and listen to. The brouilleur is balanced on a glass via the four glass feet which hold it in place, and as the water dripped through the bottom of the metal funnel-shaped bowl, it fell onto a small metal piece below which alternately swung up and down as a result of the water droplets striking it and rolling down the side. 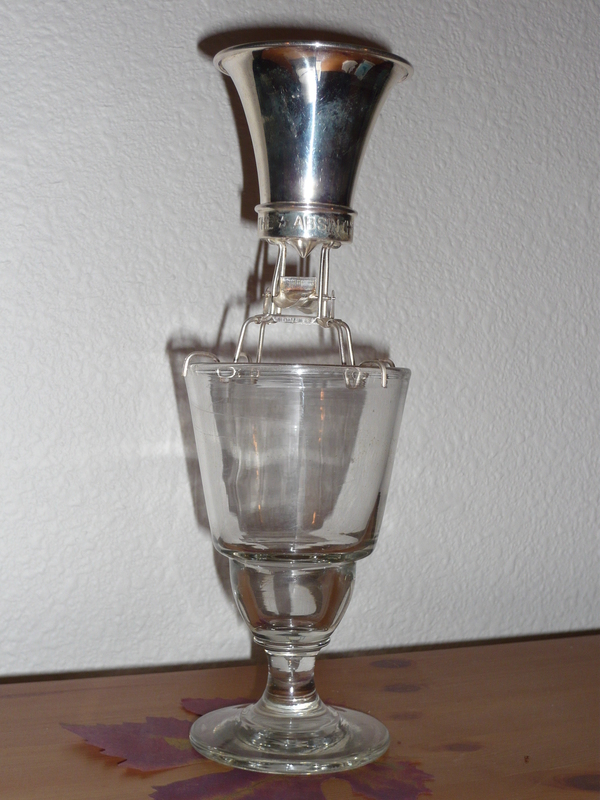 Here is a picture of a modern 21st century reproduction of the auto verseur placed on top of an antique Lyonnais absinthe glass (similar to a Pontarlier-style glass, but with a reservoir of a different shape) from the late 19th century. World War I, known as the “Great War” or “the war to end all wars” in the years immediately following its conclusion, was a cataclysmic moment of global change in uncountable ways. With specific regard to absinthe, the lead-up to it, and the actual onset of the war itself, would be the final nail hammered by the temperance movement into a coffin that was decades in the making. Following an earlier ban in Switzerland, absinthe was banned in France in 1915, ostensibly to preserve French genetic stock and her soldiers on the battlefield, despite the fact that absinthe was utilized as a health elixir and water purifier to French soldiers less than 100 years prior in French Algiers. The next few years of war would soon prove their at least that part of their intention to be horribly ineffective, as over one million French soldiers are thought to have perished by the end of World War I. 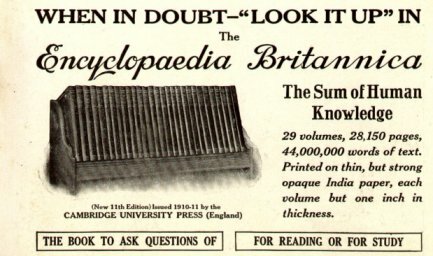 During the same period of time before the outbreak of war, a group of scholars were working on what was to be the final edition of the Encyclopedia Britannica to be produced entirely (or nearly so) in Britain. The eleventh edition, published between 1910-1911, is still regarded as perhaps the finest to be produced by Encyclopedia Britannica, and indeed by any encyclopedia. While it’s use of certain textual devices such as “pathetic fallacy” (which is basically the anthropomorphism of inanimate objects as if they had feelings or intellect) renders it somewhat less than academic or reliable for modern scholarship, it provides a fascinating snapshot of the world as seen and defined through the eyes of a changing populace which was leaving the industrial age of the 18th and 19th centuries behind, and stepping into the technological age of the future. It is arguably all the more endearing for it’s slight and awkward imperfections. ABSINTHE, a liqueur or aromatized spirit, the characteristic flavouring matter of which is derived from various species of wormwood (Artemisia absinthium). 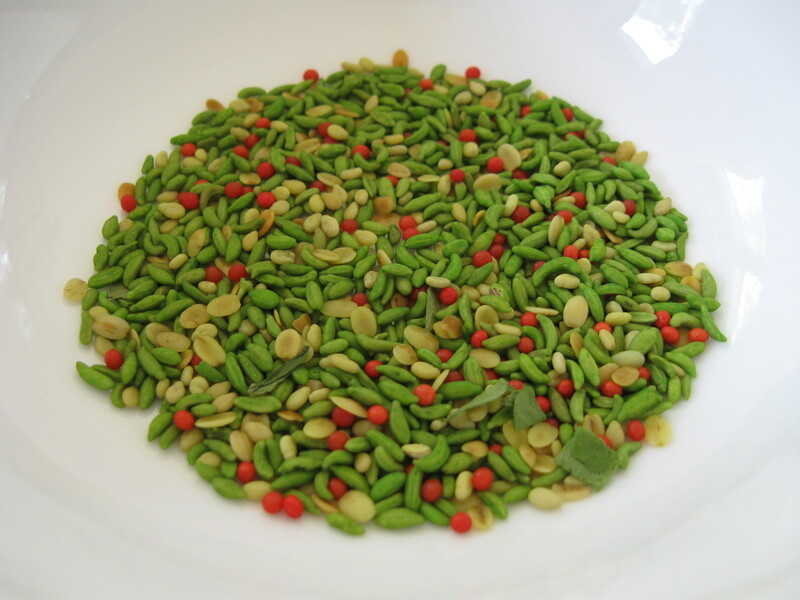 Among the other substances generally employed in its manufacture are angelica root, sweet flag, dittany leaves, star-anise fruit, fennel and hyssop. A colourless “alcohólate” is first prepared, and to this the well-known green colour of the beverage is imparted by maceration with green leaves of wormwood, hyssop and mint. 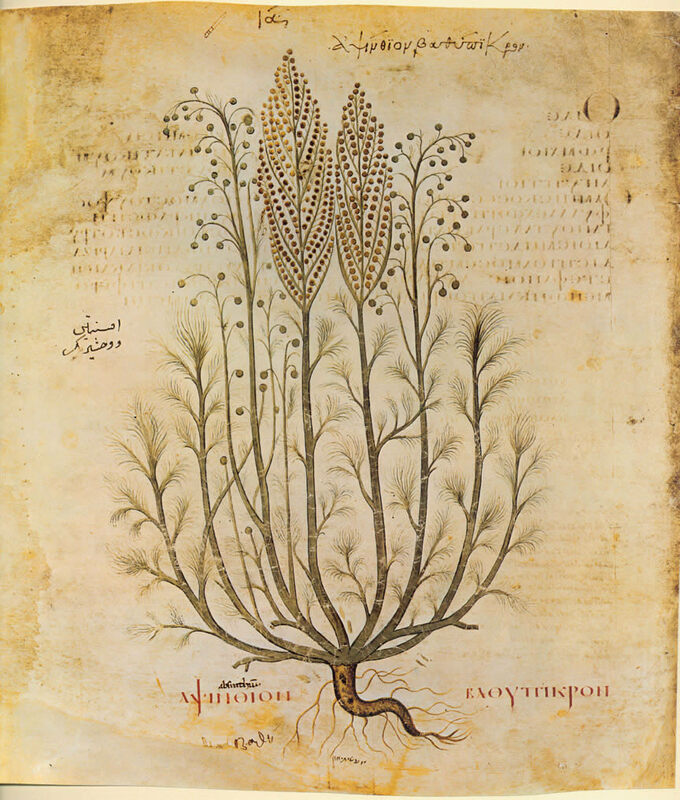 Inferior varieties are made by means of essences, the distillation being omitted. There are two varieties of absinthe, the French and the Swiss, the latter of which is of a higher alcoholic strength than the former. 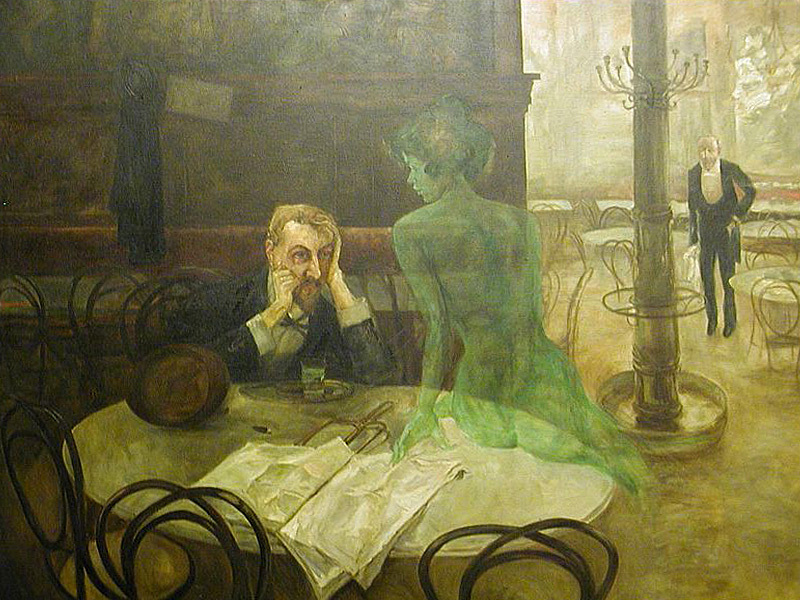 The best absinthe contains 70 to 80% of alcohol. It is said to improve very materially by storage. There is a popular belief to the effect that absinthe is frequently adulterated with copper, indigo or other dye-stuffs (to impart the green colour), but, in fact, this is now very rarely the case. There is some reason to believe that excessive absinthe-drinking leads to effects which are specifically worse than those associated with over-indulgence in other forms of alcohol. Consider the A. Vichet distillery. This was a large distillery well-known for quality absinthe which was a bit on the sweet side (although I have personally only heard of a small handful of Vichet absinthe which have survived into modern times, and so sadly have not been able to get much information on how it has aged), and yet the name probably would not have had quite the same recognizability as Pernod Fils, Oxygénée, Berger, nor a few of the other distillers with “Pernod” in their name. It wouldn’t have made a lot of business sense to commit all of their resources to try to outdo the top two or three absinthe producers which had already established dominance, and so the Vichet offered a wide range of liquors and liqueurs (and even wines), as did most distilleries. 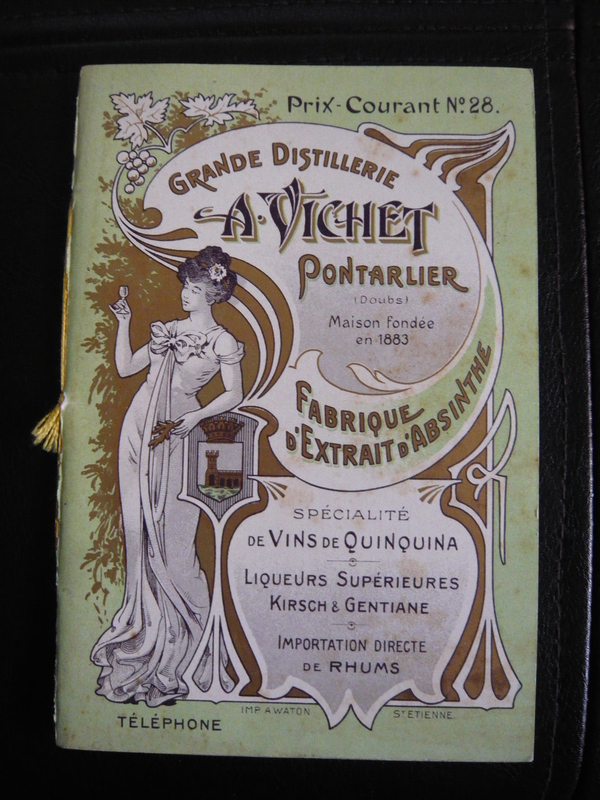 From quinquina to creme de cacao, kirsch to curacao to cognac, Vichet offered pages of different liquid lovelies within the pages of its product brochure, oftentimes in both “top shelf” and “mid shelf” qualities. 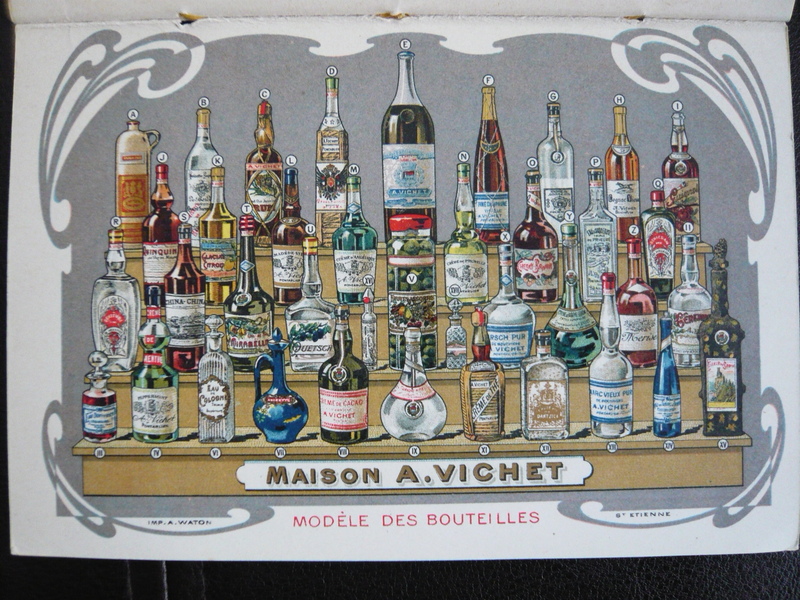 See above for the cover of their product brochure number 28 (circa 1909), and below for the inside back cover illustration of the various bottles they offered for sale within the same brochure. Any discussion of absinthe in its heyday is not complete without mentioning Pernod Fils. Pernod Fils was the single-most popular brand of absinthe in the late 19th and early 20th centuries, right up to the French ban in 1915. Although the true origin of absinthe is hotly debated, including whether or not the doctor known as Pierre Ordinaire was an historical personage at all, or something more of an allegorical figure, what is known for certain is that Henri Louis Pernod and Daniel Henri Dubied opened one of the very first absinthe distilleries in 1797. While the brand would largely become identified with France as a result of the Pernod factory built in Pontarlier in 1805, Pernod Fils absinthe production actually began in Couvet, Switzerland in 1797. At the height of its popularity, Pernod Fils was producing 30,000 liters of absinthe PER DAY, and in addition to satisfying the thirst of millions of French drinkers, the product was shipped to many faroff and exotic countries which had likewise developed a taste for absinthe, or which were at least hosting some European expatriates (such as Paul Gauguin, in Tahiti). It was of the highest quality, as indicated by the absinthe superiore designation, and the best-selling brand of the day. Of course, Pernod Fils didn’t get to be the Green Fairy’s favorite emissary by being slouches and keeping a good thing to themselves. Production increases over there years, and in the mid-to-late 1800s, Pernod Fils continued to capture the favor (and the francs) not only of the bourgeoisie, but also of the middle-class. Of note in this period is that Pernod Fils continued to use a grape base alcohol for their absinthe, rather than the far cheaper industrial alcohol which many other brands used, even after the devastating phylloxera blight which all but destroyed grape vines in France beginning in the 1860s and crippled the wine industry for a generation. Integrity and pride of workmanship found in an absinthe distillery? Those are some characteristics the government and the temperance movement curiously failed to acknowledge (and emulate). Of the variety of marketing avenues the company explored, one of the best known was an elegant advertising image which became familiar to thousands of bar and cafe patrons throughout France starting in 1880. Specifically, it was a chromolithograph based on an oil painting done by artist Charles Maire. In a rather unique process, the chromolithograph print was applied to a canvas backing, and then varnish was applied to create the illusion of an actual oil painting. Each one was stretched and mounted on wood, then placed in a custom-made gilt-wood frame painted gold and featuring wormwood leaves. The end result was a sort of still-life look at absinthe, featuring a bottle of Pernod Fils, two Pontarlier-style reservoir glasses, a glass carafe full of cold water, and a newspaper proudly displaying the Pontarlier town name (which by that time had become home to more than 20 absinthe distilleries). 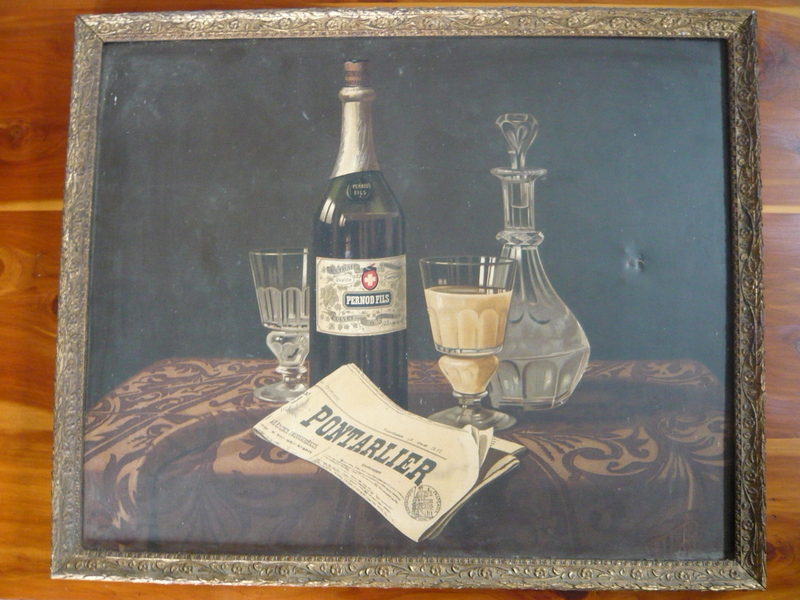 For absinthe historians and distillers, this artwork is particularly interesting in that it features a completely prepared glass of absinthe which accurately displays the a proper louche for Pernod Fils. Exactly how cloudy an absinthe SHOULD appear after preparation is a matter of some debate among modern distillers even today, with some insisting that a louche should not appear to be “milky.” This image unequivocally demonstrates the appropriate thickness of the Pernod Fils louche.